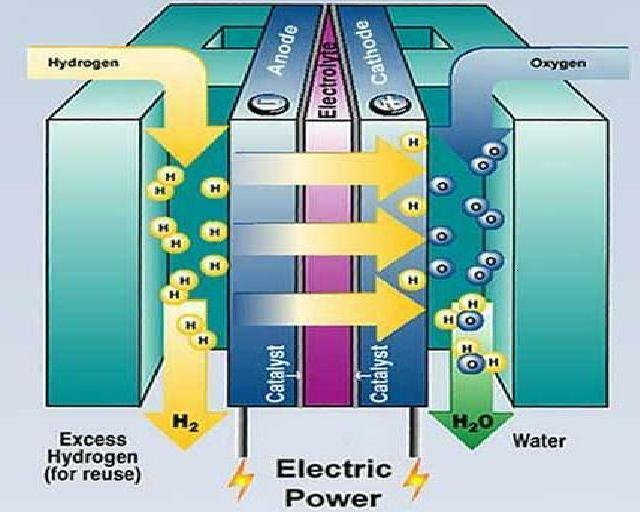 At the anode, hydrogen is oxidised (losing electrons). My first question is this: why is the anode negative if it is attracting electrons? My second question refers to the fact that once the hydrogen atoms are iodised, the H+ ions move through the electrolyte towards the oxygen ions at the cathode, reacting to form water. If the anode is negative, why would positive H+ ions move away from it? It is not attracting electrons, it is attracting hydrogen atoms. The electrode binds the hydrogen and releases the electrons. The electrons are then able to flow out through the wire. Once the electrons have returned to the cathode, the cathode is more negative than the anode. The positive ions move to the cathode and the negative ions move to the anode. In a galvanic cell, the anode is positively charged. The cathode is negatively charged. A good mnemonic I learned a while ago is that anions go to the anode, and cations go to the cathode. This is because opposite electric charges attract. So negatively charged anions are attracted to the positively charged anode. And positive cations are attracted to the negative cathode. The electron itself was originally discovered as the component particles of cathode rays from cathode ray tubes. That electrons come out of the cathode is a hint about cathode charge: the buildup of electrons on the cathode eventually results in the emission of an electron beam. If electrons are building up, the cathode must be negative. Anode as such is positive and cathode is negative.Hydrogen gets oxidized at the anode by giving an electron,so the anode becomes rich in electrons. The flow of electrons is from anode to cathode. Hence anode which is rich in electrons, compared to cathode, is represented as negative. Cathode being negative attracts the hydrogen ions, which gets reduced when it receives electrons from anode via an external circuit. Not the answer you're looking for? Browse other questions tagged electrochemistry redox electricity or ask your own question.